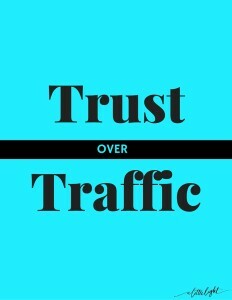 Traffic, page views, visitors, likes, followers. These are the proverbial cat calls of the internet world. Why? If these numbers are high then we must be read/watched….understood….appreciated….adored. Therefore, we must be successful in all the efforts we’ve spent building an online platform. Every hour of storytelling, creating, curating, perfecting, promoting was another hour that your family and friends didn’t understand what all this was for. Anyone in social media will tell you they have love/hate relationship with these numbers. We crave them like a secret obsession, but we know it’s only for our egos. After all, when you put so much of yourself out to the online world your ego is left standing on the stage naked. Here is the thing about site stats and followers . . . they start the cycle of feeling successful, comparing, feeling unsatisfied. I remember exclaiming to my husband how amazing it was that one hundred people liked my Facebook page! That was ONE HUNDRED! people who said, ‘sure, I’d like to make room for this blog to be a daily part of my Facebook creeping feed’. I was over the moon. Of course the numbers have grown a little more since then but with all the talk of monetizing and reach, I zoom out and my stats are a drop in the bucket of what is considered ‘successful’. But I don’t care. Because I still have those 100 people who wanted what I had to share with them. They aren’t ‘traffic’ to me, they are my ‘readers’ and they have given me a gift – their trust. Every time I post something, they are trusting me that I won’t waste their time. They are trusting the words I write and the photos I take to be true. They are trusting that I am who I say I am. They are trusting me to only share with them the content and products that I believe are of value to them. I’m not saying traffic is meaningless. There are 3001 ways to boost your traffic, and you should do a fraction of them. 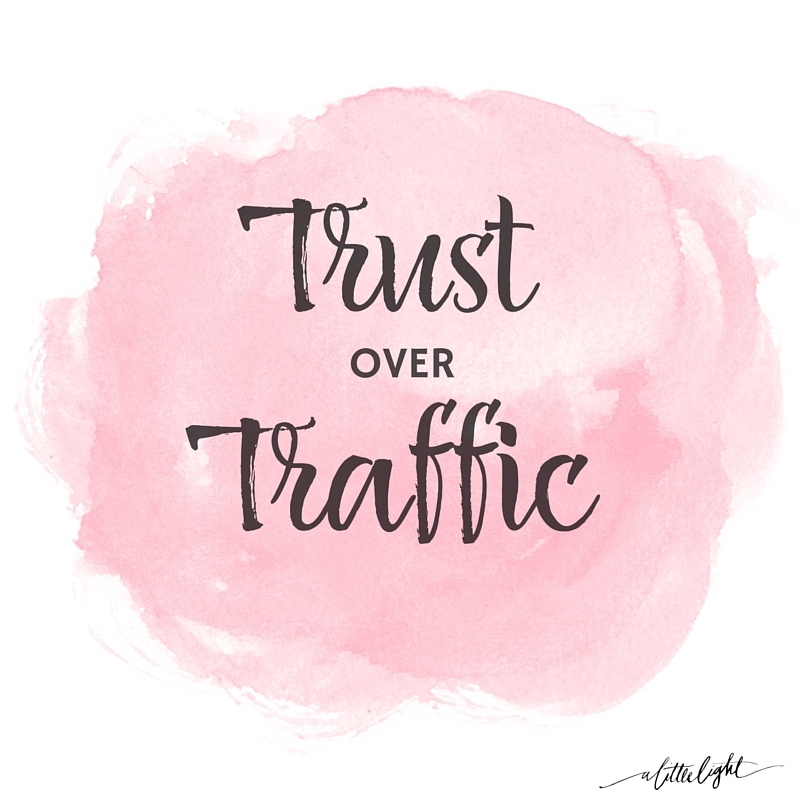 There is no shame in wanting to grow your platform, to share your work, to increase your readership. 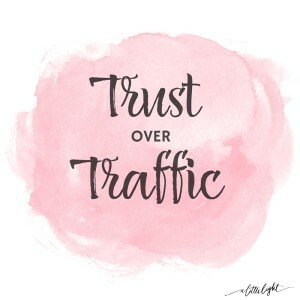 Also, when the traffic increases so does the ability to make money, and blogging isn’t exactly a free hobby. 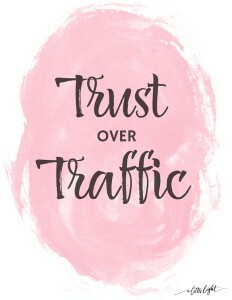 But if traffic is our main goal then we will be forever cycling the circle of wanting more. 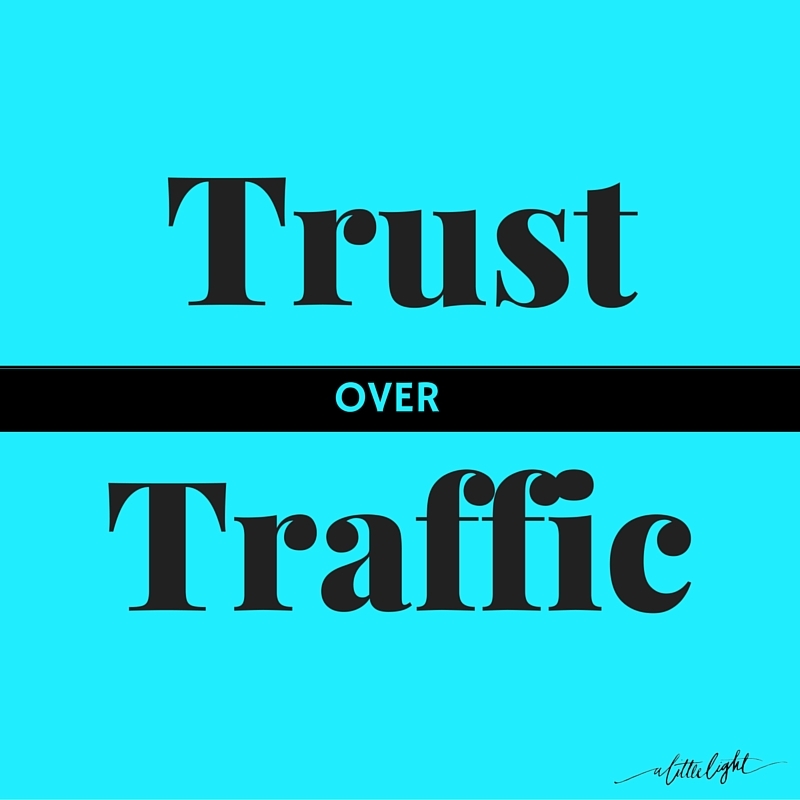 If we don’t appreciate the readers we have – the ones who show up, engage and share – then we are losing their trust. It is like having guests over for a party and spending the whole time on the phone trying to invite even more people to come over. 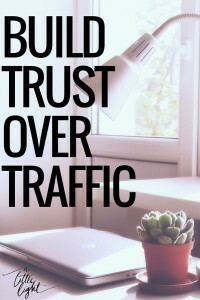 This creates a revolving door of traffic without the accumulation of recurring, devoted readers. 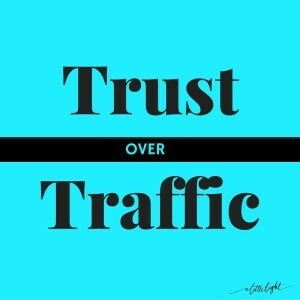 Traffic and trust are not mutually exclusive, but just one of them can be satiated. 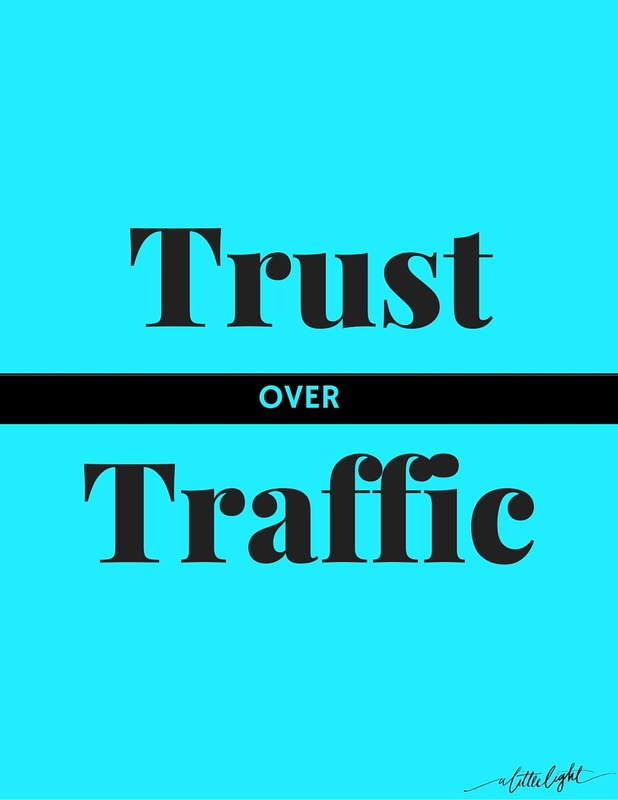 Some ways to build trust over traffic . . . .
Next time you are stressing about getting more traffic to your site, ask yourself if it is worth breaking you back for. Work hard at what you do, but for the right reasons and in the right places. Because maybe all we really need in this online space is community, purpose, passion, and 100 (or 1000) true fans. Print it out and put it up . . . .
Share it in social media . . . . 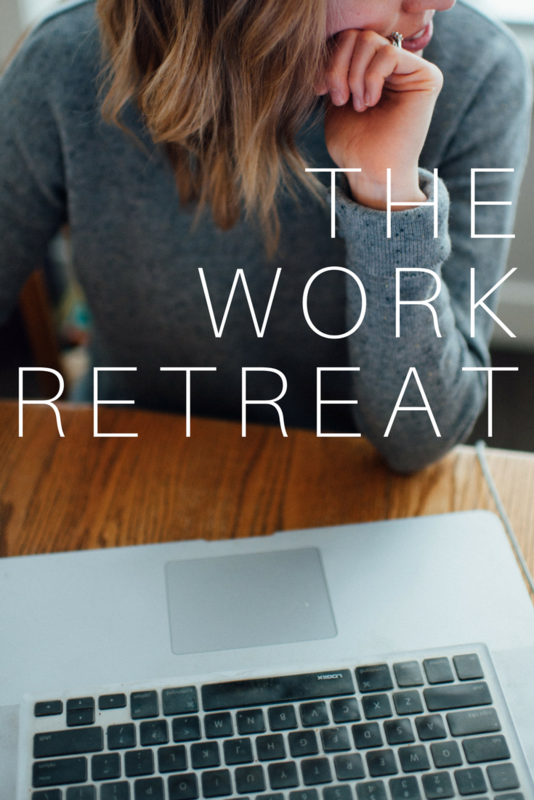 This post has been heavily inspired by the Fizzle Show podcast (so good, check it out). This is so exactly what I needed to read today. Thank you! As a business woman who struggles to fit in to mainstream retail, this is what I needed to read today. Thank you. Thank you for your comment Deborah!